Here is a section from the study guide that guides the group through chapter two. 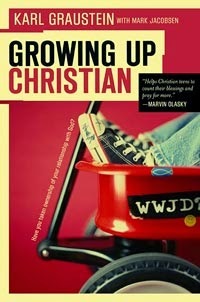 If you would like the complete study guide, please email me through growingupchristian.com. CHAPTER 2: IN or OUT? Take a few moments to read, consider, and answer each of these questions. 1. Do you pray? What do you pray about? 2. Do you read the Bible? Do you enjoy reading your Bible? Do you experience God teaching you when you read your Bible? 3. Do you worship God? Why do you worship? 4. Do you think about God? What aspects of God do you think about? 5. Do you confess your sin to God? 1. Why do you pray? 2. Why do you read your Bible? 3. Why do you go to church? 4. Why do you attend youth meetings? 5. What do you think about in times of corporate worship? 6. Why do you do good works? 7. Why do you acknowledge sin in your life? 8. Why do you obey your parents? 1. Do you talk about God with your friends? 2. Do you tell non-Christians about your faith? 3. Do you have a good relationship with your parents? 4. Do you enjoy spending time with true Christians? 5. Do you desire to serve others? 1. What is false assurance of salvation? What is true assurance of salvation? 2. Why do church kids tend to assume they are Christians, even if they are not? Why is this so dangerous? 3. How does a person become a Christian? 4. How can you know if a person is a Christian? What kind of words and actions would you expect in the life of a true Christian? 5. Who is one person you know that you are confident is a Christian? How do you know? 6. Why is it important to consider the thoughts and motives behind your actions? 7. What did you learn about yourself through the “Look in the Mirror” II Corinthians 13 self-test? 8. Are you a Christian? How do you know? 9. Do your parents believe you are a Christian? Why? 10. If you are a Christian, do you remember a specific time when you first believed? 11. What is the gospel? What does it mean to believe the gospel? Why did Jesus have to die on the cross? 1. What is one point that challenged you from the small group discussion or the reading? 2. What is one specific application for your life today?